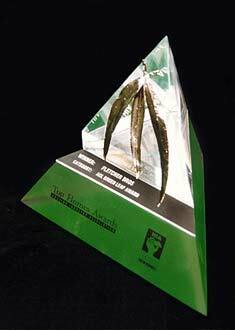 I designed this Major Award as one of the 'family'of awards for this client. 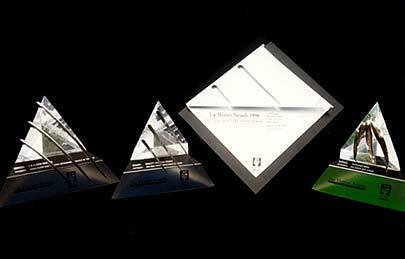 Based upon the awards program logo, which was a triangle with three stripes through it, the awards reinforce the branding of the program. 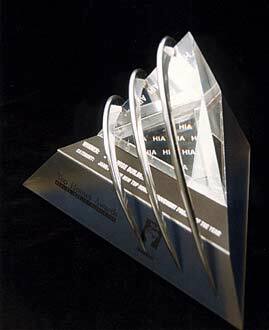 The optical quality of the acrylic allows the client's well known initials to disappear and reappear depending upon the angle at which the award is viewed. The accompanying 'Energy Efficiency Award' and the Awards family are shown below, left.